The new rule, which takes effect Jan. 1, 2017, requires certain employers to electronically submit injury and illness data that they are already required to record on their onsite OSHA Injury and Illness forms. Analysis of this data will enable OSHA to use its enforcement and compliance assistance resources more efficiently. Some of the data will also be posted to the OSHA website. OSHA believes that public disclosure will encourage employers to improve workplace safety and provide valuable information to workers, job seekers, customers, researchers and the general public. The amount of data submitted will vary depending on the size of company and type of industry. UPDATED: How will electronic submission work? OSHA has provided a secure website that offers three options for data submission. First, users are able to manually enter data into a webform. Second, users are able to upload a CSV file to process single or multiple establishments at the same time. Last, users of automated recordkeeping systems will have the ability to transmit data electronically via an API (application programming interface). The Injury Tracking Application (ITA) is accessible from the ITA launch page, where you are able to provide the Agency your 2017 OSHA Form 300A information. The date by which certain employers are required to submit to OSHA the information from their completed 2017 Form 300A is July 1, 2018. The rule also prohibits employers from discouraging workers from reporting an injury or illness. The final rule requires employers to inform employees of their right to report work-related injuries and illnesses free from retaliation, which can be satisfied by posting the already-required OSHA workplace poster. It also clarifies the existing implicit requirement that an employer’s procedure for reporting work-related injuries and illnesses must be reasonable and not deter or discourage employees from reporting; and incorporates the existing statutory prohibition on retaliating against employees for reporting work-related injuries or illnesses. These provisions become effective August 10, 2016, but OSHA has delayed their enforcement until Dec. 1, 2016. The anti-retaliation provisions become effective August 10, 2016, but OSHA delayed their enforcement until Dec. 1, 2016. Establishments with 20-249 employees in certain high-risk industries must submit information from their 2017 Form 300A by July 1, 2018. Beginning in 2019 and every year thereafter, the information must be submitted by March 2. Under the OSHA Recording and Reporting Occupational Injuries and Illness: Reporting Fatality, Injury and Illness Information to the Government – the following is the requirement for injury and illness reporting. Within eight (8) hours after the death of any employee as a result of a work-related incident, you must report the fatality to the Occupational Safety and Health Administration (OSHA), U.S. Department of Labor. Within twenty-four (24) hours after the in-patient hospitalization of one or more employees or an employee’s amputation or an employee’s loss of an eye, as a result of a work-related incident, you must report the in-patient hospitalization, amputation, or loss of an eye to OSHA. By telephone or in person to the OSHA Area Office that is nearest to the site of the incident. By telephone to the OSHA toll-free central telephone number, 1-800-321-OSHA (1-800-321-6742). By electronic submission using the reporting application located on OSHA’s public Web site at osha.gov. If the Area Office is closed, may I report the fatality, in-patient hospitalization, amputation, or loss of an eye by leaving a message on OSHA’s answering machine, faxing the Area Office, or sending an email? No, if the Area Office is closed, you must report the fatality, in-patient hospitalization, amputation, or loss of an eye using either the 800 number or the reporting application located on OSHA’s public Web site at www.osha.gov. Do I have to report the fatality, inpatient hospitalization, amputation, or loss of an eye if it resulted from a motor vehicle accident on a public street or highway? If the motor vehicle accident occurred in a construction work zone, you must report the fatality, in-patient hospitalization, amputation, or loss of an eye. If the motor vehicle accident occurred on a public street or highway, but not in a construction work zone, you do not have to report the fatality, inpatient hospitalization, amputation, or loss of an eye to OSHA. However, the fatality, in-patient hospitalization, amputation, or loss of an eye must be recorded on your OSHA injury and illness records, if you are required to keep such records. Do I have to report the fatality, inpatient hospitalization, amputation, or loss of an eye if it occurred on a commercial or public transportation system? No, you do not have to report the fatality, in-patient hospitalization, amputation, or loss of an eye to OSHA if it occurred on a commercial or public transportation system (e.g., airplane, train, subway, or bus). However, the fatality, in-patient hospitalization, amputation, or loss of an eye must be recorded on your OSHA injury and illness records, if you are required to keep such records. Do I have to report a work-related fatality or in-patient hospitalization caused by a heart attack? Yes, your local OSHA Area Office director will decide whether to investigate the event, depending on the circumstances of the heart attack. What if the fatality, in-patient hospitalization, amputation, or loss of an eye does not occur during or right after the work-related incident? You must only report a fatality to OSHA if the fatality occurs within thirty (30) days of the work-related incident. For an in-patient hospitalization, amputation, or loss of an eye, you must only report the event to OSHA if it occurs within twenty-four (24) hours of the work-related incident. However, the fatality, in-patient hospitalization, amputation, or loss of an eye must be recorded on your OSHA injury and illness records, if you are required to keep such records. What if I don’t learn about a reportable fatality, in-patient hospitalization, amputation, or loss of an eye right away? If you do not learn about a reportable fatality, in-patient hospitalization, amputation, or loss of an eye at the time it takes place, you must make the report to OSHA within the following time period after the fatality, in-patient hospitalization, amputation, or loss of an eye is reported to you or to any of your agent(s): Eight (8) hours for a fatality, and twenty-four (24) hours for an in-patient hospitalization, an amputation, or a loss of an eye. What if I don’t learn right away that the reportable fatality, in-patient hospitalization, amputation, or loss of an eye was the result of a work-related incident? If you do not learn right away that the reportable fatality, in-patient hospitalization, amputation, or loss of an eye was the result of a work-related incident, you must make the report to OSHA within the following time period after you or any of your agent(s) learn that the reportable fatality, in-patient hospitalization, amputation, or loss of an eye was the result of a work-related incident: Eight (8) hours for a fatality, and twenty-four (24) hours for an inpatient hospitalization, an amputation, or a loss of an eye. How does OSHA define “in-patient hospitalization”? OSHA defines inpatient hospitalization as a formal admission to the in-patient service of a hospital or clinic for care or treatment. Do I have to report an in-patient hospitalization that involves only observation or diagnostic testing? No, you do not have to report an in-patient hospitalization that involves only observation or diagnostic testing. You must only report to OSHA each inpatient hospitalization that involves care or treatment. How does OSHA define “amputation”? An amputation is the traumatic loss of a limb or other external body part. Amputations include a part, such as a limb or appendage, that has been severed, cut off, amputated (either completely or partially); fingertip amputations with or without bone loss; medical amputations resulting from irreparable damage; amputations of body parts that have since been reattached. Amputations do not include avulsions, enucleations, deglovings, scalpings, severed ears, or broken or chipped teeth. 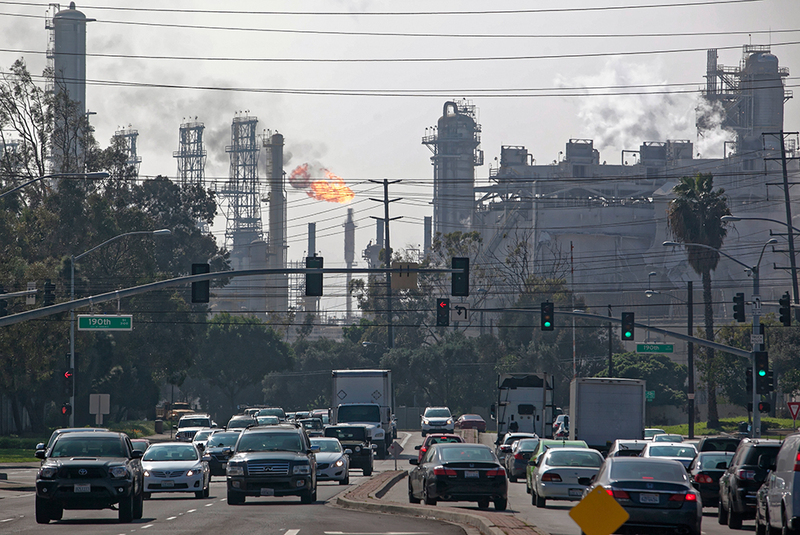 Los Angeles—Cal/OSHA today issued 19 citations to ExxonMobil Refining & Supply Company for workplace safety and health violations following an investigation into the February 18 explosion at the company’s Torrance refinery that injured four workers. The proposed penalties total $566,600. Eighteen of the citations were classified as serious due to a realistic possibility of worker death or serious injury. Six of these serious violations were also classified as willful because Cal/OSHA found that Exxon did not take action to eliminate known hazardous conditions at the refinery and intentionally failed to comply with state safety standards. ExxonMobil has 15 working days to appeal the citations to the Occupational Safety and Health Appeals Board. “Petroleum refineries have the responsibility to keep workers safe, and to also protect nearby communities and the environment,” said Christine Baker, Director of the Department of Industrial Relations (DIR). “This investigation revealed severe lapses in Exxon’s safety protocols.” Cal/OSHA is a division of DIR. A 2007 safety review uncovered concerns about flammable vapor leakage in the ESP. Management knew of potential fire or explosion hazards as a result of the leakage, and failed to correct the danger. Exxon’s incident response team, which included ExxonMobil senior management, was aware of a leaking spent slide valve on the FCC unit before the accident occurred. The FCC unit had not been working properly for as many as nine years prior to the incident. There was no functional pressure transmitter and as a result, ExxonMobil was unable to monitor hydrocarbon pressure buildup in the unit. There was no written operating procedure for placing the FCC unit in hot standby, which is a state between startup and shutdown that can be compared to working on an idling car. Cal/OSHA issued an order prohibiting use of the FCC unit on February 18, and that order remains in effect until ExxonMobil can demonstrate that the unit is safe to operate. 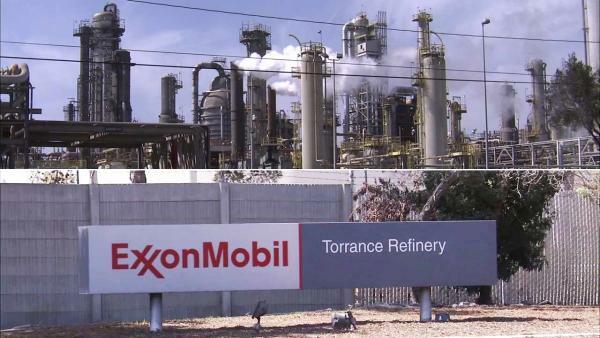 Cal/OSHA has investigated ExxonMobil’s Torrance facility twice in the last five years for accident-related incidents that resulted in serious workplace injuries in 2011. On March 29, 2011, a refinery operator was working on the FCC unit, attempting to shut down a failed pump when a motor in the pump suffered mechanical failure and exploded. 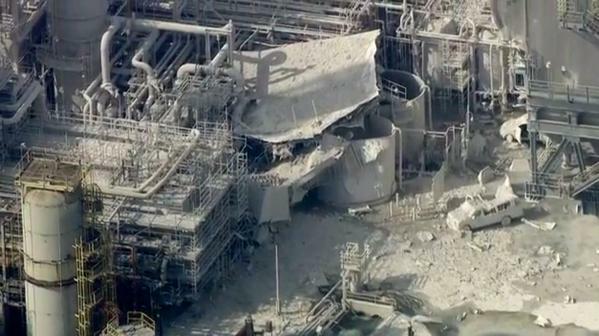 The worker suffered a fractured jaw and lost six teeth in the accident. 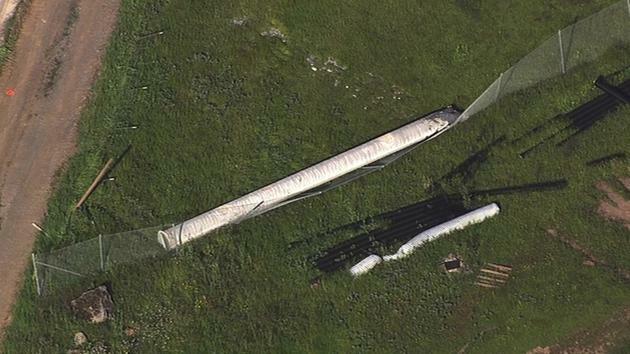 The other accident in September 2011 did not occur in the FCC unit. Cal/OSHA issued three serious and five general citations in those cases. Both the February 18 explosion and the August 6, 2012 Chevron refinery fire in Richmond have led to proposed improvements in petroleum refinery regulation. The proposed changes include damage mechanism reviews (DMRs), employee participation, safeguard protection analysis and hazard control analysis. The Governor’s Interagency Refinery Task Force was formed in the aftermath of the 2012 Chevron refinery fire, and includes participants from 13 agencies and departments. Cal/OSHA’s Process Safety Management Unit is responsible for inspecting refineries and chemical plants that handle large quantities of toxic and flammable materials. Health and safety standards enforced by the PSM Unit, including adequate employee training, are intended to prevent catastrophic explosions, fires and releases of dangerous chemicals. 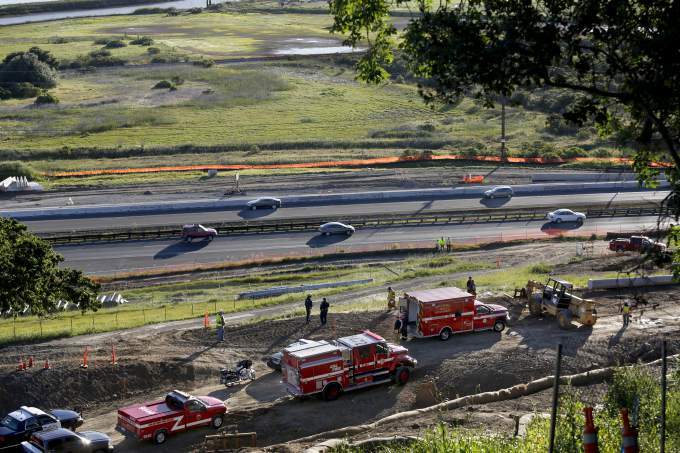 a fatal accident at a Petaluma construction site in April. 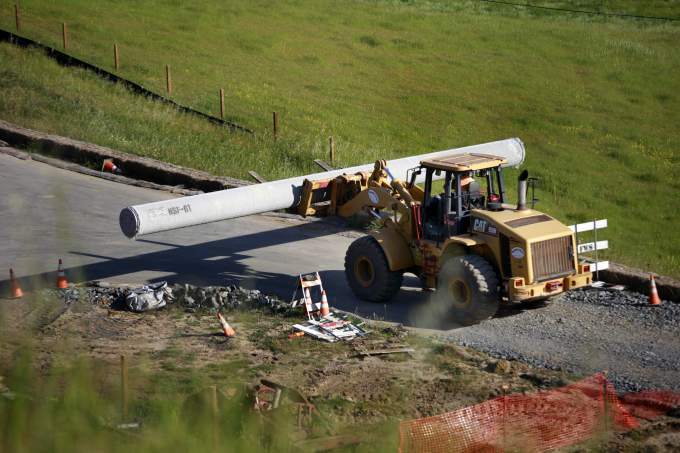 A 28-year-old worker from Novato was killed when a 40-foot concrete-coated steel pipe being unloaded from a forklift rolled down a slope and crushed him. “This fatality could have been avoided had the required safety measures been in place for working at a hazardous location,” said Christine Baker, Director of the Department of Industrial Relations (DIR). Cal/OSHA is a division of DIR. The accident occurred around 7 a.m. on April 15 near Highway 101, where Maggiora & Ghilotti, Inc. of San Rafael was replacing an old water pipe. The employee was working with a forklift operator to unload and transport the new pipe down a sloping dirt road. The pipe weighed approximately 8,000 pounds and was not secured to the forklift; it was unloaded directly to the ground without any chocks or barrier to prevent it from moving. The worker was facing the pipe when it slid off the forks, rolled over him and was finally stopped by a chain link fence. “Employers must be vigilant in recognizing job hazards and keeping their employees safe by taking the necessary precautions in all aspects of an operation,” said Cal/OSHA Chief Juliann Sum. Cal/OSHA’s American Canyon office issued three citations to Maggiora & Ghilotti for failing to recognize and plan for the hazard of transporting the steel pipe, for failing to survey and plan for the hazards of uneven ground, and for not securing the pipe during transport. The three citations total $38,250. Cal/OSHA helps protect workers from health and safety hazards on the job in almost every workplace in California. Cal/OSHA’s Consultation Services Branch provides free and voluntary assistance to employers and employee organizations to improve their health and safety programs. Employers should call (800) 963-9424 for assistance from Cal/OSHA Consultation Services. Employees with work-related questions or complaints may call DIR’s Call Center in English or Spanish at 844-LABOR-DIR (844-522-6734), or the California Workers’ Information Hotline at 866-924-9757 for recorded information in English and Spanish on a variety of work-related topics. Complaints can also be filed confidentially withCal/OSHA district offices. For media inquiries, contact Erika Monterroza at (510) 286-1164 or Peter Melton at (510) 286-7046.